The fair is one of the most anticipated by the suppliers of the furniture industry. 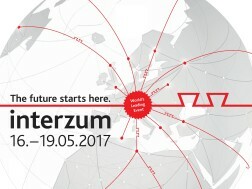 We too will attend the Interzum exhibition in Cologne, from 16th to 19th May. Come visit our booth (Hall 10.1, Stand A011). We will exhibit our new metal-free products specifically produced for the needs of eco-friendly furniture manufacturers. These are hides characterized by maximum comfort and high quality and are manufactured taking into account environmental sustainability through metal-free tanning process and low-impact technologies.